Daughters of the King is a national religious order of Episcopal laywomen that was founded in New York in 1885. The members commit themselves to a Rule of Life based on prayer, service, and evangelism. Their mission is the extension of Christ’s Kingdom and the strengthening of the spiritual life of the Church. Our “Woman of the Well” Chapter meets the first Saturday of the month at the parish hall for prayer, study and fellowship. A training period is required for membership, and each member promises at her installation to abide by the Rule of Life. Any woman who is interested in becoming a Daughter of the King or who would like additional information may contact the president, Christi Crow (see contact form, below). 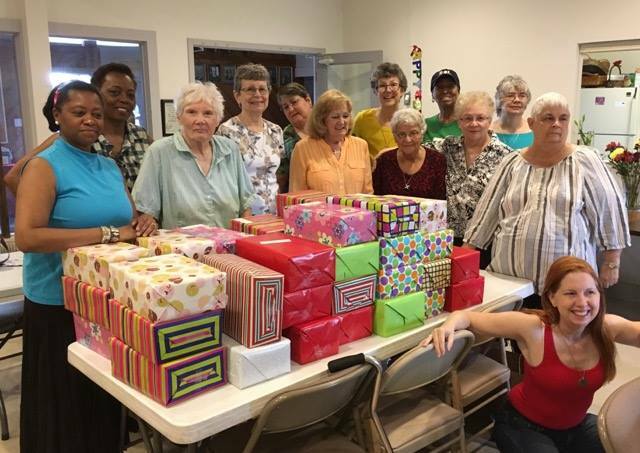 St. John’s DOK Chapter fills and gift wraps shoeboxes with toiletries and other small items that are given to staff at the Austin State Hospital for distribution to patients who are leaving the facility and are in need of immediate personal supplies. Daughters donate items to fill the boxes, and also accept donations from church members. The chapter hosts receptions for funerals and memorial services when that service is requested by a family and with other ministries of the church participate in hosting coffee hours and lenten soup suppers. DOK chapters are not allowed to conduct fund-raising projects, but themselves donate funds for national programs and chapter projects. St. John’s chapter contributes regularly to SAMS (South American Missionary Society) in support of a Daughter from Austin who is a missionary to Honduras. Email Christi Crow, DoK President, for more information!